We recently had the pleasure to work with photographer Maude Touchette during a small showing of Forgotten Fairy Tales. Click here to see our “behind the scenes” photo album. Forgotten Fairy Tales teaser now online! The Canadian chapter of the international puppetry union now has an online directory of members! The Flying Box Theatre is thrilled to be alongside such an inspiring and talent group of artists. Take a moment to check out the directory–it’s full of beautiful work! We are taking the show on the road! 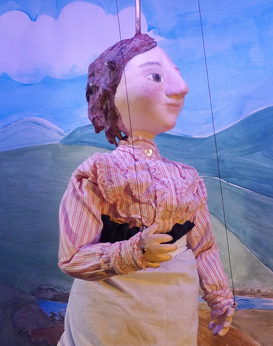 The Flying Box Theatre will be making a short trip to Eastern Ontario for shows on June 13 and 14, in McDonald’s Corners, Sharbot Lake and Perth. Co-founder Jesse Orr just got back from a short artist’s residency in Smithers, B.C. at the Main Street Studio. Check out her facebook album to see photos of some of the puppets that came out of this paper-craft puppet workshop! The Girl Giant was the very first marionette that Jesse and I built for this project, all the way back October of last year. We were lucky enough to have the help of Lydia Lorrain, animator and miniaturist extraordinaire, as we stumbled our way through the building process. Lydia sculpted the head and hands of the Girl Giant puppet, Jesse built the body, and I made the costume, so it was definitely a collaborative effort! 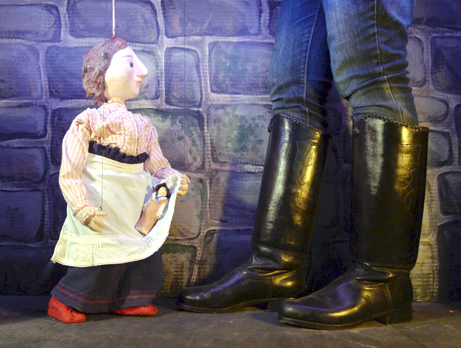 We told the Girl Giant’s story in our initial short showings last fall, and she has made a reappearance this spring as part of the cast of Hans Dudldee and Other Forgotten Fairytales. This time I got to be the puppeteer, which was a bit stressful at first. She is a lot of fun to play with though, and I’ve started to get the hang of her bouncing walk. We’ve learned a lot in the process of making her and working with her in performance, and I’m sure she’ll continue to appear in our upcoming work!